This handy SEO Checklist will help you optimize every blog post you write for organic search. 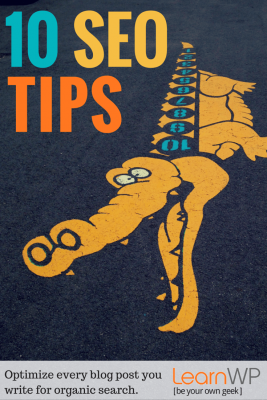 The 10 tips outlined here are tried and true and even five years later they all apply. Would you keep spending time writing and posting fabulous content on your blog if you knew no one was reading it? 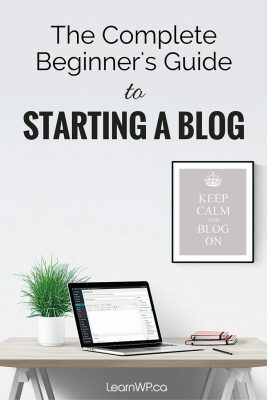 Bloggers blog so that others will read and engage with what they’ve written. While SEO (Search Engine Optimization) isn’t a blogger’s main concern when posting, it shouldn’t be ignored if you want your content to be found. 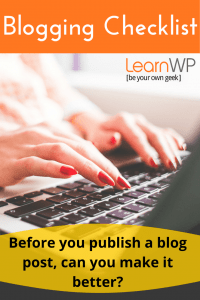 It takes a little more effort to optimize your blog posts but it can be worthwhile if you see an increase in the amount of traffic you get to your blog. This may seem like a lot of work but if follow our SEO checklist you’ll learn to practice these points as you write your post and it will soon become second nature. 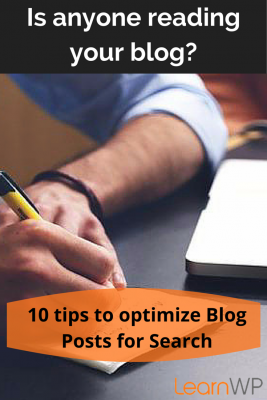 Here’s our top 10 SEO checklist to help you optimize every blog post you write for organic search. used a focus keyword appropriately in the post content? included keywords in the post titles? optimized images used in the post? added links to and from older posts? customized the SEO Meta Title? written a custom Meta Description? properly categorized and tagged your post with keywords? promoted your post on social media? Keywords are phrases and terms that searchers type into Google. If you want to enhance your blog’s visibility in search, you need to incorporate these keywords in the post. You may want to do some keyword research to determine the best search term or phrase. Without over doing it use the focus keyword in the body of your post and as you follow the rest of these steps to optimize your post. You want to write a catchy post title that will grab your reader’s attention but you also need to include your focus keyword in the post title. If your WordPress theme has been built properly your post title will be an H1 title tag. This is the most important place to use your focus keyword on the page. Also, use keyword phrases in subtitles (h2, h3, h4) throughout the post. Title tags highlight for search engines and site users the main point of what comes below. Post Permalinks need to be concise and should contain your main keyword(s). I’ve written previously about how to properly set the WordPress permalink structure. It’s best to have the title of your post in the post URL. If your permalink structure is set correctly WordPress will automatically pull the post title into your permalink. You’ll likely need to edit these permalinks to shorten them. When you edit permalinks keep them short, use keywords, stick to lowercase and use dashes to separate the keywords, not spaces. Search engines don’t read images they read text. When indexing images, search engines take cues from the image’s context. Optimizing images for search involves adding keyword-targeted textual content around your images to tell search engines what the images are about. There are four points to optimize blog images for search. Optimize the Title and Alt Tag of each image. Alt text is read by screen readers for visually impaired users, it shows as a tooltip when you mouse over an image and it will display on the page if the image fails to load. Interlinking between blog posts is a great idea to keep users on your site longer. Interlinking is also a great way to keep older blog posts active. If you use keywords in the link anchor text (the words of the link) you are telling Google more about what that other post is about. Update older posts to link from related keywords to your newly published content. You don’t have to limit links to other posts on your site, you can link to a category or a tag page as well. For instance, if I write a post that refers to Pinterest I could link to another of my posts or to my entire Pinterest category page. The SEO meta title tag controls the title that appears in search results and in the tab of your browser. Your page title should be different for each page/post on your site and should use your keywords to clearly describe the post content. Like the SEO meta title the meta description tag should accurately describe the information that you are going to get when you go to that web result. Search is about user experience. You want to help searchers find what they are looking for on your blog. 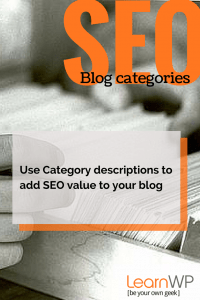 Taxonomy tools like categories and tags can help your blog do better in search results. The biggest reason to use categories and tags is to give your users another way to sort through your content and find what they’re looking for. Use categories for broad topics and put a post in only one category. Tags are a way to further break down a topic. Use tags as descriptive tools to let spiders and readers know precisely what’s in each post. Tags and categories shouldn’t overlap. Build a loyal readership by providing an easy way to subscribe to your blog. When people visit your blog if they don’t have a way to request future updates they probably won’t remember to come back. Get a free MailChimp account and add a widget to your blog’s sidebar. You can read more about MailChimp here. Every time you hit the publish button you can send your post to your subscribers. Encourage people to follow you on social media and make it easy for them to share you content with social sharing plugins. Promote every post you write on social media — Facebook, LinkedIn, Google Plus, Pinterest, and Twitter. You’ll want to come back and review the SEO checklist ten steps before you publish your next post. If you liked this post, you’ll love our Toronto SEO Workshop for WordPress. Learn tips, techniques and strategies to supercharge your organic search results. 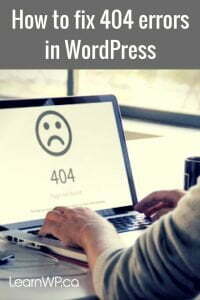 Our next scheduled SEO for WordPress workshop is on May 24, 2019. Great points about SEO , they are all valid and informative. Good tip about the slugs. I’ll have to pay more attention to mine and edit for best results.